Diet is one of the biggest determinants of your health. What you put into your body every day affects everything: your biochemistry, your mood, your brain, muscles, tendons, bones, nerves, kidneys, liver. Unfortunately, when it comes to diet, most people are on autopilot, following a disease-making Western Diet that is high in acidic foods and low in alkaline foods. The Western dietary pattern also called the Standard American Diet (SAD) is high in processed foods, fried foods and red meat. And it’s low in whole fruits and vegetables, whole grains, legumes and healthier fats and proteins such as nuts, seeds and fish. Many studies have concluded that the Western Diet causes and contributes to the development of heart disease, dementia, osteoporosis, cancer, high blood pressure, obesity, diabetes and autoimmune diseases. The explanation is very simple. Your body evolved to work optimally when provided with the right environment to function. The internal environment in your body requires a healthy mix of nutrients, and when it doesn’t get them consistently over time, things go haywire. For a more in-depth look at biochemistry and its impact on your health, read Dr. Neustadt’s article, Change Your Biochemistry to Change Your Health. One way diet affects your health is through a process called “acid-alkaline balance.” The pH (potential of hydrogen) determines a substance’s acidity or alkalinity and is measured on a scale of 0 to 14. The lower the pH the more acidic the solution. The higher the pH the more alkaline (or base) the solution. When a solution is about in the middle of the range—neither acid nor alkaline—it has a neutral pH of 7. The body regulates pH in very narrow ranges. In the different organs throughout the body, finely tuned physiological systems constantly work to keep the pH within specific ranges for optimal function. Stomach acid, which is important for healthy digestion and as a protection against potential infections, has a low pH, about 2-3. When the pH of your stomach cannot get low enough, it causes problems with digestion and can create acid reflux. Most people and medical approaches to acid reflux assume that there’s too much acid, when in fact the problem might to too little acid. Blood is kept at a neutral pH, between 7.35-7.45. 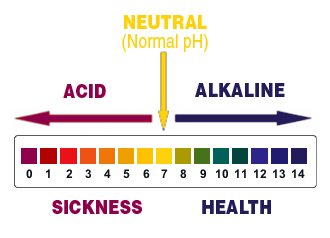 When your blood becomes too acidic, fine-tuned physiological mechanisms kick in to adjust the pH to a healthy level. One way it does this is by releasing calcium from bone. Over many years, this may contribute to developing osteoporosis. The Western diet is composed of acidic foods such as proteins, cereals, sugars and processed foods. Dietary acid load in the modern diet can lead to a disruption in acid-alkaline homeostasis in various body compartments and eventually result in chronic disease through repeated borrowing of the body’s alkaline reserves. The opposite of acidic foods is alkaline foods. In the Western Diet, alkaline foods such as vegetables are eaten in much smaller quantities; their alkaline content is insufficient to neutralize surplus acids. Stimulants like tobacco, coffee, tea, and alcohol are also extremely acidifying. Stress and physical activity (both insufficient or excessive amounts) also cause acidification. Many foods as they exist in nature alkaline-producing by nature, but manufactured and processed foods transform the nutrient content of foods and make them mostly acid-producing. It’s important to balance each meal with 75% alkaline-producing to 25% acid-producing to maintain health. We need plenty of fresh fruits and particularly vegetables (alkaline-producing) to balance our necessary protein intake (acid-producing). This pattern is essentially similar to the Mediterranean Diet, which research over the past 50 years has shown to be the healthiest dietary pattern. And we need to avoid processed, sugary or simple-carbohydrate foods, not only because they’re acid-producing but also because they raise blood sugar level too quickly (high glycemic index therefore fattening), are nutrient-lacking and may be toxic too. If you want to test your pH levels to determine if your body’s pH needs immediate attention you can do so using pH strips. Doing so lets you determine your pH factor quickly and easily in the privacy of your own home. If your urinary pH fluctuates between 6.0 to 6.5 in the morning and between 6.5 and 7.0 in the evening, your body is functioning within a healthy range. If your saliva stays between 6.5 and 7.5 all day, your body is functioning within a healthy range. The best time to test your pH is about one hour before a meal and two hours after a meal. Urine testing may indicate how well your body is excreting acids and assimilating minerals, especially calcium, magnesium, sodium, and potassium. These minerals function as “buffers.” Buffers are substances that help maintain and balance the body against the introduction of too much acidity or too much alkalinity. Even with the proper amounts of buffers, acid or alkaline levels can become extreme. When the body ingests or produces too many of these acids or alkalis, it must excrete the excess. The urine is the perfect way for the body to remove any excess acids or alkaline substances that cannot be buffered. If the average urine pH is below 6.5 the body’s buffering system is overwhelmed, a state of “autotoxication” exists, and attention should be given to lowering acid levels. The blood pH has to be kept within a tight range of with a normal range of 7.36 to 7.44. An imbalanced diet high in acidic foods such as animal protein, sugar, caffeine, and processed foods puts pressure on the body’s regulating systems to maintain this neutrality. The extra buffering required can deplete the body of alkaline minerals such as sodium, potassium, magnesium, and calcium, making the person prone to chronic and degenerative disease. Minerals are borrowed from vital organs and bones to buffer (neutralize) the acid and safely remove it from the body. Because of this strain, the body can suffer severe and prolonged damage due to high acidity–a condition that may go undetected for years. Foods: are they Acid or Alkaline-forming? Note that a food’s acid or alkaline-forming tendency in the body has nothing to do with the actual pH of the food itself. For example, lemons are very acidic, however, the end-products they produce after digestion and assimilation are very alkaline so lemons are alkaline-forming in the body. Likewise, the meat will test alkaline before digestion but it leaves very acidic residue in the body so, like nearly all animal products, meat is very acid-forming. It is important that your daily dietary intake of food naturally acts to balance your body pH. There are several versions of the Acidic and Alkaline Food chart to be found in different books and on the Internet. The following foods are sometimes attributed to the Acidic side of the chart and sometimes to the Alkaline side. Remember, you don’t need to adhere strictly to the Alkaline side of the chart, just make sure a good percentage of the foods you eat come from that side.